The previous two articles on decompression theory introduced and discussed numerous processes that occur in our body as we breathe gases under pressure whilst diving. Some of it is pretty straight forward, some of it makes your brain hurt and probably reminds you of your weird physics teacher from school that accidentally spat on you whenever they opened their mouth. I’ll presume that if you are reading this you found it interesting enough to continue. After the work of Robert Workman and others in the sixties, we really thought we were getting a handle on the science of diving. But nothing is ever that straight forward, especially when it comes to science, or handles. In 1976 Dr. Merrell Spencer published a report that put a rather significant spanner in the works of decompression theory. The focus of the report was the detection of so-called silent bubbles in the bloodstream of divers. They weren’t bubbles that were causing DCS, the bubbles were found in divers showing no symptoms, who had all dived well within the limits of the dive tables of the time. Prior to this, the idea of asymptomatic bubbles had been discussed (in fact as early as 1951 by Bateman and Behnke), but as it was only considered a theoretical possibility, mainstream decompression research continued to focus on all inert gases interacting with the body whilst in solution. In light of Dr. Spencer’s work the plot had thickened, curdled, boiled over the pan, hardened on the cooker and turned into a bubbly white elephant; time to get the Marigold gloves on. Subsequent investigations of silent bubbles suggest that they may be permanently present in the bloodstream, even for people who have never been diving. This is due to a combination—predominantly mechanical in nature—of cavitation, micro-nucleation, and tribonucleation. Micro-nucleation relates to impurities in the blood stream that allow bubbles to latch on to (commonly joints and blood vessels), so called “gas-seeds”. This is the reason why weight training is considered unwise before and after diving. The intentional microscopic damage to muscles and ligaments forms ideal micro-nucleation sites. Cavitation is something that we see in boat propellers, mantis shrimps stunning their prey, and the pipes “knocking” in your central heating system. Essentially, fluids undergoing pressure changes create low pressure cavities of vapour, which at high pressures can implode and cause a shockwave. At more intermediate pressures you are left with a bubble. Blood can, under some circumstances produce localised cavitation such as in joints when limbs are contorted, or when the blood is pumping faster, such as during exercise or when thinking about your overdraft. Tribonucleation is the formation of bubbles between two submerged surfaces when those surfaces are suddenly pulled apart. This movement creates negative pressure, which can produce localised supersaturation. Too much of which leads to bubbles. The best non-diving example of this is when you crack your knuckles. People commonly think the cracking sound is caused by a bubble in the joint popping, but it’s actually the shock wave on surrounding synovial fluid as a bubble is formed that makes the sound. Silent bubbles are now considered to be a completely normal consequence of diving. However, it’s very hard to correlate silent bubble size and frequency with DCS cases. Some people get bent with few or no silent bubbles, and others don’t get symptoms of DCS even though they have what is considered an excess of silent bubbles. Remember, an M-value is a theoretical line through a large, fuzzy grey area. However, as DCS is a bubble of gas in tissue or blood that causes symptoms of varying severity, attempting to reduce the size and amount of any kind of bubbles is obviously going to be a good thing for a diver. What we do know about silent bubbles is that the body is normally very good at filtering them out. When they arrive at the lungs they get trapped in the fine capillaries, where they then diffuse out through the lung lining. However, if too many silent bubbles get trapped this can reduce the overall efficiency of the lungs to off-gas, which can cause a bottleneck and result in slower off-gassing. The other effect that silent bubbles have is that they can cause excessive tiredness, caused by initiation of the compliment system, which is an immune system response in this case induced by the presence of these “foreign invaders”. This process has no effect on the bubbles as they are inert. So, increased fatigue after a dive may be an indication of a bad dive profile, dehydration, fast ascent rate, or a combination of these. Given that we know that gases are roaming freely around our bodies as well as being dissolved in our tissues during a dive, we also know that they will be subjected to the same laws of physics as everything else, such as Boyle’s law. Therefore, some of the modern decompression algorithms have been modified to try and account for the behaviour of dissolved gases and gas in the free-state. Such algorithms are known as dual phase, or bubble models. There are a number of different models to choose from—Varying Permeability Model (VPM), Reduced Gradient Bubble Model (RGBM), and varieties of each to choose from. They all still use the concepts of half-times and M-values for the dissolved gases, but they also try to model the size and shape of bubbles as they are subjected to differing pressures over the course of a dive. To explain how they do this involves going down the road of bubble mechanics, which is very math-oriented, so let’s not do that. But in simple terms we know that a bubble has a number of different forces acting on it. It has the external ambient pressure, the surrounding tissue pressure, and its own surface tension (known as the Laplace pressure). All of these forces are interacting in a way that will determine whether or not gas will diffuse into the bubble and make it bigger, or diffuse out and shrink it. If a bubble reaches a certain size, it is thought to have reached a so-called critical limit, which could then mean that it may turn into a symptomatic bubble. The entire point of these models is to keep the bubble below this critical volume. The differences between how each model does this is beyond the scope of this article, but, for example, of the two most popular ones, VPM is based on the work of Dr. David Yount and stems from experiments done in a lab using gels. RGBM is the brainchild of Dr Bruce Wienke, is proprietary, and is based on real diving data from within the commercial diving industry. Dissolved gas models try to get the diver as close to the surface as soon as possible, where most off-gassing will take place. However, this causes a conflict with what the bubble models are trying to achieve. After ascending from the deepest part of a dive, they want to keep ambient pressure high. This has the effect of keeping the pressure inside a bubble higher than the partial pressure of the gas in the surrounding tissues, so that either bubbles will not get any bigger, or may actually shrink a little. But if too much time is spent deep then slow tissues will continue to on-gas, which means longer stops in the shallows- an important consideration on decompression dives. So dual phase models try and marry these two opposing factors into a best fit compromise. Deep stops are used, but are brief so as to minimise slow tissue on-gasing. Ascent rates affect everything I have mentioned in all of these articles, M-values, amount of supersaturation, and size and amount of silent bubbles. They vary, depending on who you learn to dive with. Whilst most recreational divers go to the deepest part of their dive first and then gradually and slowly shallow up throughout the rest of their dive, technical divers also do the deepest part of their dive first, but know that ascending too slowly from the bottom to the first decompression stop can complicate and extend their overall decompression obligation. Look at the recreational ascent rate limits: BSAC specifies an ascent rate of 15m/min (up to 6m), SSI is 9m/min, and PADI is 18m/min. No one seems to agree on what the ideal rate is, or even whether there is a single ideal rate. Paul Bert recommended 3m/min, Haldane recommended 1.5- 9m/min, Buhlmann said 10m/min. In 1958 the US Navy reviewed the ascent rate for Navy divers. Their scuba divers wanted a 30m/min ascent rate, but hard hat divers thought this was too fast for them in their heavy gear, so a compromise of 18m/min was set. This is probably where PADI’s ascent rate comes from. Most PADI instructors sensibly don’t go up faster than their computers allow (9m/min). 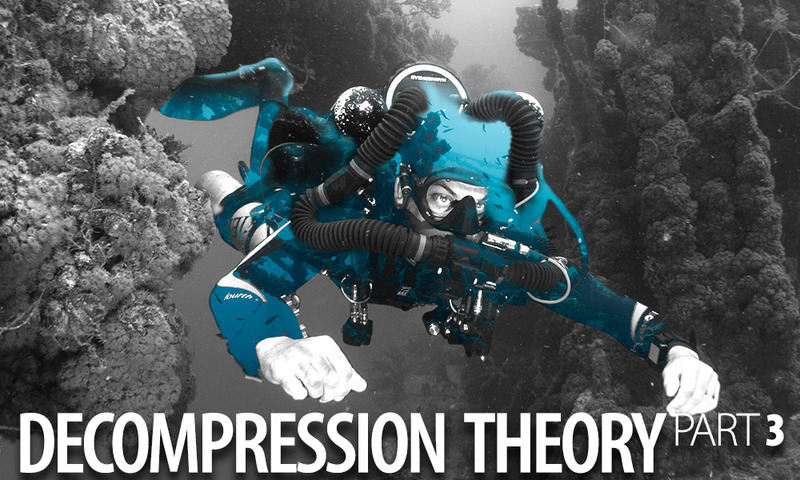 For decompression dives, common practise is that, from the bottom portion of the dive, through the deep stops to the first decompression stops, 9m/min is the maximum (and also the minimum), then until the shallow stop at 6m the ascent rate is 3m/min. From 6m to the surface it’s 1m/min. For recreational no-stop dives, when you start a slow, gradual ascent during the dive, this is actually very inefficient in terms of off-gassing. Why? It’s all about reducing so-called decompression stress and inducing the inert gas gradient. If I ascend very slowly as I dive along, I am also very slowly reducing ambient pressure. This doesn’t get the supersaturation going that you need in your fast tissues, so you end up doing most of your off-gassing on the surface after the dive. It also means that your slower tissues may continue to on-gas until you shallow up. Nowhere near the point of saturation, but enough to gradually have to off-gas more on the surface. Numerous studies have shown this. If on the other hand I ascend from the deepest part of the dive to an intermediate depth, say from 30m to 18m, and move at or close to 9m/min, I will be maximising that inert gas gradient and minimising my slow tissue on-gassing. Remember that your tissues will off-gas halfway from where they are to what the new ambient pressure is. If I’ve reduced ambient pressure more, that’s 50% of a bigger distance. The time that I spend at 18m means that I will be off-gassing more whilst still on my dive. Then I can move up to say 12m, then 9m, then do an extended safety stop. This is more of a quality of dive issue in terms of how tired you will feel afterwards, as I know that I will feel way less tired if I dive this kind of profile, than if I do a very slow ascent. But again that’s as subjective as someone insisting that they feel less tired after diving on nitrox. The original aim of these articles was to provide an overview of decompression theory as we currently understand it, and then outline what we don’t understand. It took a long time to even cover the basics of what we do understand. What we don’t understand is easy to explain…most of it. Tissue compartments and M-values are a mathematical way of trying to mimic biological processes. The human body is far too complex to be able to model accurately. Tissue compartments and M-values are an educated best guess, no more. Millions of people dive every year without incident, so they seem to work in some way, but we don’t know what really is right about them and what isn’t, as it’s very difficult to perform studies on divers who give subjective responses to questions about less than precisely controlled dive profiles. Controlled studies on large groups of divers of the type that might produce statistically relevant results just don’t happen. Moreover, a small proportion of divers go to the chamber for treatment of DCS, even having stayed within the limits imposed by their dive computer, and it’s actually quite difficult to say that it was even definitely DCS! One study will come out saying that you need to slow your ascent rate in the last 10m- the biggest relative pressure change, then another will come out saying that 9m/min all the way to the surface is more effective as long as you do a decent safety stop. Then add repetitive dives and mixed gases into the mix! Albert Buhlmann’s work lives on in the form of most dive computer algorithms. Haldane used 5 tissue compartments in the 1908 Royal Navy tables, Buhlmann used 16 in his last ZHL algorithm. If you’re diving on trimix that’s 32 compartments; 16 for N2 and 16 for He. So during a deep trimix dive there are potentially 32 different tissue compartments on-gassing at different rates that will then also off-gas at different rates, and each of them has their own M-value, which will change depending on the depth. If you’re using VPM or RGBM then in addition to these 32 compartments bubbles are also being modelled in terms of size and frequency at all points of a dive. A pretty complicated crap shoot all in all. The fact that we have different computer algorithms, dive tables and ascent rates just goes to show how uncertain our attempts to model complex biology are. I haven’t even touched on trimix diving, gradient factors, the effects of using hyperoxic mixtures to accelerate your decompression, or rebreather diving! There is a hell of a lot more to know, and whilst progress was being made in the 70s and 80s, this was because of the need to understand the effects of saturation diving in the oil and gas industry. They had a lot of money to throw at the problem. Unfortunately all the things that saturation divers used to do can now be done by ROVs, so decompression research has slowed off quite a bit since then. Much of what we continue to learn about decompression results from technical divers doing decompression dives with doctors and decompression researchers keeping track of their dive profiles. I suspect that by the time we will have really understood what’s happening to us on a dive, we’ll be diving in a way that means we don’t need to take inert gasses into our bodies anymore. We’ll probably have learned how to breathe those aqueous fluids that are supersaturated with oxygen directly into our lungs, as was demonstrated by a rat in the James Cameron film the Abyss! In my opinion a big selling point of technical diving is that there is always more to learn, absorb, practice and challenge oneself with. I enjoy hearing, reading and discussing new ideas on how we can dive more safely, and look forward to seeing and experiencing the continuing evolution of our fascinating sport. Richard Devanney is a multi-agency instructor. He currently lives and works in Reykjavik, Iceland, as a full-time instructor. He previously managed Big Blue Tech, a successful and well-respected TDI technical diving school in Thailand. After 4 years in Thailand, he left to continue pursuing his own technical diving ambitions and get back in a drysuit.